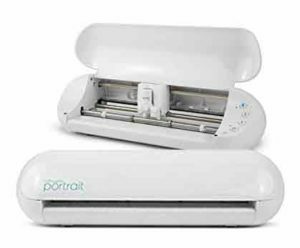 The Cricut Explore Air 2 was released in late 2017, so it includes lots of new technology and improvements to the original Explore Air model. It has a maximum cutting size of 12 inches by 24 inches, and it cuts twice as fast as the original model. The machine can cut more than 100 materials besides vinyl, and it has a smart set dial that automatically adjusts the settings for different materials. It comes with materials to do a test project, so you can get used to the machine before starting on something more important. The Explore Air 2 is Bluetooth enabled, and you can visit the Cricut website to set up the machine. The site will show you a series of prompts to assemble the machine and connect it to Bluetooth, so it should be fairly straightforward. Cricut has a library of over 3,000 designs on their site that you can choose from, or you can upload your own. The machine uses the Design Space software, which works on computers, tablets, and phones. To design on your phone, you should download the Cricut Design App. Unfortunately, you can only use the Design Space software on this machine. If you’re familiar with another design software, you’ll have to relearn everything on Design Space, which can take some time. A few users have mentioned that the Design Space website has glitches occasionally, too, and you can’t use the machine if the website isn’t running. Also, you need an internet connection to use the machine. The Explore Air 2 is a bit louder than other models as well, so it might not be the best choice if you work late at night or if you work close to other people. 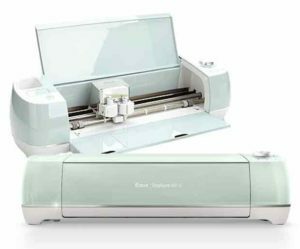 Cricut is one of the largest and most trustworthy crafting brands, and the Explore Air 2 is one of the best vinyl cutting machines available. If you don’t mind the noise and will always have an internet connection while working, this machine is a great option. It’s fast, precise, and reliable, and it has an intuitive and easy-to-use design. The Silhouette Cameo 3 is one of the top machines for large personal projects. It can cut materials up to 12 inches wide and 10 feet long, which is a much larger area than most machines. 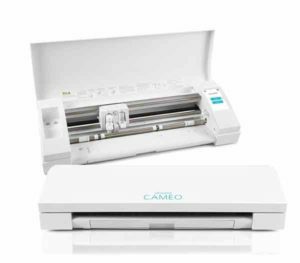 The Cameo 3 has a matless cutting feature, so it doesn’t require a mat to cut vinyl and some other materials. It also has an AutoBlade feature, so the blade self-adjusts based on the material you’re using. This saves time and eliminates the risk of forgetting to adjust the blade. Another great feature is the dual-carriage, which lets the machine use two tools and perform two jobs at once. Several users have left complaints about the Bluetooth being difficult to set up or not working well, especially on Apple devices. If you can’t get the Bluetooth to work, you can upload designs to the machine using the USB cable that comes with the product. However, plugging the machine into your computer may be time-consuming and difficult depending on the setup of your workspace. Another issue with the Cameo 3 is its steep learning curve. The machine comes with a user guide for setting it up and connecting it to a computer, but the guide doesn’t include all the information you need to operate the machine. The Cameo 3 may not be the best choice for beginners since it requires some knowledge of vinyl cutting machines to operate. This machine uses the Silhouette Studio design software, but it has a plug-in for Adobe Illustrator and Corel Draw. Both of these programs have more features than Silhouette Studio. If you already have experience with Adobe or Corel, you can design on one of those programs and simply connect it to the Silhouette machine. When you buy the Cameo 3, you’ll also get access to the Silhouette Design Store, where you can purchase designs and keep them permanently. Some design stores charge a monthly subscription fee, but the Silhouette store charges you based on what you purchase. This is good if you only need a few designs, but it can get expensive if you want to download lots of them. The Cameo 3 is a heavy-duty machine that can handle large projects quickly and efficiently. It takes some time to figure out all the features, so it’s better for experienced crafters than for beginners. If you’re a professional crafter or an intense hobbyist, this machine is one of the best for speed, efficiency, and precision. 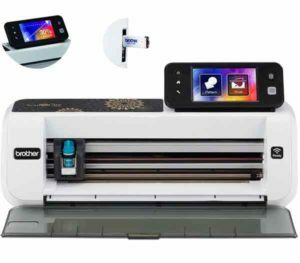 Brother is one of the oldest and most trustworthy crafting brands, and their vinyl cutting machines have many loyal users. The CM350, also known as the ScanNCut2, is one of their most popular machines. It has an LCD touch screen display to adjust settings, and it comes with over 600 built-in designs. The machine is supported by the ScanNCutCanvas software, and Brother offers an app for editing and designing your own projects on a tablet or mobile device. The CM350’s standout feature is its built-in scanner. The ScanNCut2 is the only vinyl cutting machine on the market with a built-in scanner, and this can make completing projects much faster and easier. This feature allows you to scan anything directly to the machine without having to upload it to your computer or send it from the design software. If you do want to send a design to the machine from another device, the CM350 also has a wireless design transfer feature. You can send files from the design software right to the machine from your computer or tablet without having to plug it in. You can use a USB cable as well, but you’ll have to buy it separately. Some users say that the ScanNCutCanvas software is not as advanced as other software. The software and the machine itself have a steep learning curve, and the ScanNCut site isn’t always helpful for figuring it out. There are lots of tutorials on YouTube and on crafting websites, so you should hopefully learn to use the machine with some assistance. You should read the manual thoroughly to make sure you use the machine properly, too, even if you’re an experienced crafter. A few reviewers also mention that the mat is sticky at first. During the first two or three uses, the sticky mat may damage the materials as you try to remove them. It will lose its stickiness quickly, though, so you can break the mat in by doing a few test runs before starting on a big project. Overall, the Brother CM350 is a top-notch vinyl cutter. Once you adjust to the machine, you’ll be able to complete lots of projects with careful precision. It’s recommended for people who already have some experience with vinyl cutting and who are willing to spend a little extra on a high-quality machine. 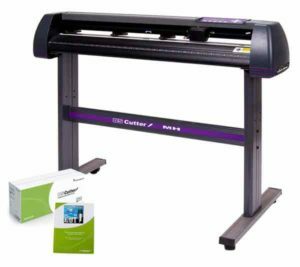 The USCutter 28-inch Vinyl Cutter is a standard, mid-range machine. It’s designed for beginners and comes with the Beginner’s Value Bundle. This includes a variety of different tools and materials to start up your crafting collection. You’ll get one black and one white vinyl roll, which are both 12 inches by 5 yards. You’ll also get two pinch-rollers, tape rolls, a squeegee, and magnetic sign blanks. The product includes a knife with a No. 11 blade and an aluminum handle, which is good for cutting lightweight materials. The biggest issue users report with the USCutter machine is that their software isn’t always user friendly. The VinylMaster Cut has lots of helpful features, but it’s not always easy to figure those features out. This can be especially frustrating for beginners, so it may be better to import files from Corel Draw or Adobe Illustrator than to try to design with the VinylMaster Cut software. Another issue is that the machine can be noisy when cutting. After some time, the sound can become very annoying, and it may bother your family members, roommates, or neighbors. Despite a few issues, the USCutter 28-inch machine is one of the best beginner options. The machine itself is easy to set up and intuitive to use. Many reviewers mention that it’s their first machine and they have no issues learning how to use it. It comes with plenty of materials to get started on some projects, and the company offers free phone support for the lifetime of the machine. The Silhouette America Portrait 2 is similar to the Cameo 3, but it’s more compact. It’s one of the cheaper vinyl cutting machines available, but it can still produce high quality designs and projects. The machine can cut over 100 different materials, and it can handle sizes up to 10 feet long. It has a 2 millimeter clearance, so it can cut thick materials easily. The AutoBlade feature lets the blade self-adjust based on the material you’re using, which saves you time and effort. The Portrait 2 comes with a free download of the Silhouette Studio Software. You’ll get a free one-month subscription to the Silhouette store as well, so you can download a variety of different designs. The machine uses PixScan technology, so you can take a picture of an image with your camera or smartphone, upload it to Silhouette Studio, and cut it out with your machine. A few reviewers have complained about the blades losing their effectiveness fairly quickly. The lifespan of the blades will vary depending on what materials you cut and how frequently you use the machine. You should prepare to replace the blades eventually, though. You’ll also need to buy the Deep Cut blade separately if you plan on cutting thicker materials as it isn’t included with the product. The Portrait 2 is a big upgrade from the original Portrait machine. Unlike the original Portrait, it has Bluetooth capability, it’s compatible with the AutoBlade, and it has a bigger clearance size. The machine has most of the features of the Cameo 3, with the main difference being the size. The Portrait 2 is only 12 inches wide and weighs less than 6 pounds, which is great if you need to transport it. However, the smaller size also means that it can only cut smaller materials. While the Cameo 3 can cut up to 12 inches wide, the Portrait 2 can only handle a width of 8 inches. If you plan to work on large projects, you should probably spend the extra money on the Cameo 3. The Portrait 2 is an excellent option if you only work on smaller projects, though. Vinyl cutting machines are expensive, and you want to get your money’s worth. Before buying a machine, it’s important to determine which features and specifications you need for your projects. A vinyl cutting machine uses a drive motor for the engine. There are two main types of drive motors: stepper motors and servo motors. A stepper motor is a mechanical engine. Like the name suggests, it moves in small steps and uses physical gears. This motor is noisier than a servo motor and may be less precise on smaller graphics, but it’s consistent and reliable. A servo motor is digital, so it uses a digital encoder. It tends to be quieter and more precise than a stepper motor. The most important consideration when buying a vinyl cutting machine is whether you plan to use it for commercial or personal projects. Commercial projects will require larger designs, extra material, and more space than personal projects. The machine will need to work extremely quickly and efficiently to handle an industrial number of projects, and it should be heavy-duty enough to withstand frequent use. If you only need the machine for personal use, the demands for the machine aren’t quite so strict. You can probably get by with a smaller, lighter machine. The major benefits to machines designed for personal use are that they’re typically quieter and can fit more easily on a desk or tabletop. In the past few years, new vinyl cutting machines have come out with modern technology and innovative features. One of the best new features is wireless or Bluetooth capability. With this feature, you can send a design from your computer or tablet to the cutter without having to plug it in. Another great feature is automatic settings. With some new machines, you can simply press a button or flip a switch to change the settings and adjust the blade. This saves a lot of time and reduces the chances of making a mistake because you forgot to adjust the settings. Different machines can handle different sizes of materials. Do you work on smaller projects like greeting cards or vinyl decals, or do you work on larger projects like signs or banners? The size of your projects will be limited to the size of your machine, so it’s important to choose carefully. Personal vinyl cutting machines can usually handle a width of 12 inches or more, but some are smaller. You should also consider the different materials the machine is capable of cutting. Obviously, you need a machine that can cut vinyl. However, many machines cut other materials, too, which can be a great help for your projects. Even if you only do projects with vinyl right now, you may want to expand your capabilities in the future. A machine that cuts a variety of materials will make it easier to complete a variety of projects. Like with all projects, price matters as well. Generally, you’ll get what you pay for when buying a vinyl cutting machine. The more expensive models tend to be sturdier with more features and better precision. However, you don’t necessarily need to buy the most expensive machine to complete good projects. There are plenty of budget machines available that work well for smaller projects. The decision on which vinyl cutting machine to buy is ultimately up to you. The Cricut Explore Air 2 has excellent user reviews and is considered to be one of the best on the market. The Silhouette Cameo 3 is probably better for larger projects, though. If you want to easily scan and upload designs, the Brother CM350 might be the best choice. Beginners may like the ease of use of the USCutter 28-inch as well as the extra tools and materials it comes with. If you’re on a tighter budget, the Silhouette America Portrait 2 is good for smaller projects. As long as you make a careful decision, you should be happy with all of the projects you can complete with your new vinyl cutter.